I got demolition man for $12 at the Portland Retro Gaming Expo in great condition. Box and everything. They wanted more than that for nearly a loose disc at Retro Game Trader. You should see if Tursi wants to come to the PRGE this year. Drag you with him. I am still looking for a Slayer box. a31chris wrote: I got demolition man for $12 at the Portland Retro Gaming Expo in great condition. Box and everything. They wanted more than that for nearly a loose disc at Retro Game Trader. It's not bad. You just have to get used to the timing. You are still way at the beginning of the game. Plus, which fight with Simon? There are more than one. 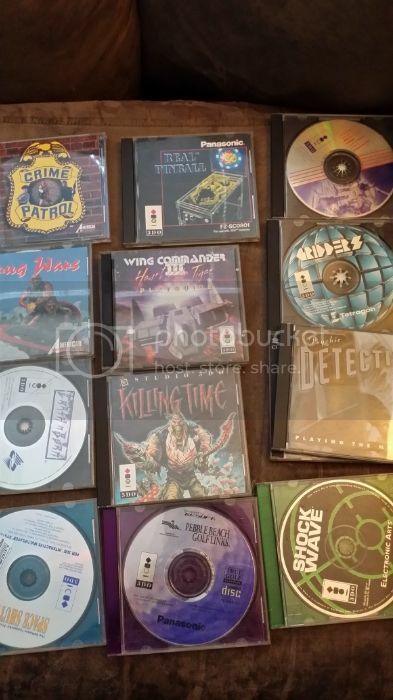 BTW, I posted pics of my 3DO collection in Collector's Corner if anyone is interested in seeing my Pitiful collection these days. I get stuck at the very first fight with Simon. Yay! I got my mits on D and Seal of the Pharoah again. They don't have the long boxes, sadly, but they do have the jewel cases with the actual artwork and booklets. Really good stuff! $14.00 each on evilbay, which shocked the Hell out of me since that stuff is usually stupid up there in price! Once they get here I'll post pics! Oh, and picked up a perfect Foes of Ali to replace mine that disappeared. Was $14.00 shipped. Excellent 3DO day for sure. Pics to come as they arrive. I got Soccer Kid for about 4 bucks, complete. Long box version of Trip'd for 30. Stellar 7 for a few bucks, longbox. Looks brand new. Pretty happy with this! Battle Sport long box for 8ish. Long box version of Shockwave for $3. Having a blast! Awesome thread idea, btw! Well, I got myself a sealed brand new Star Blade coming now too. Will be nice to play that one again. 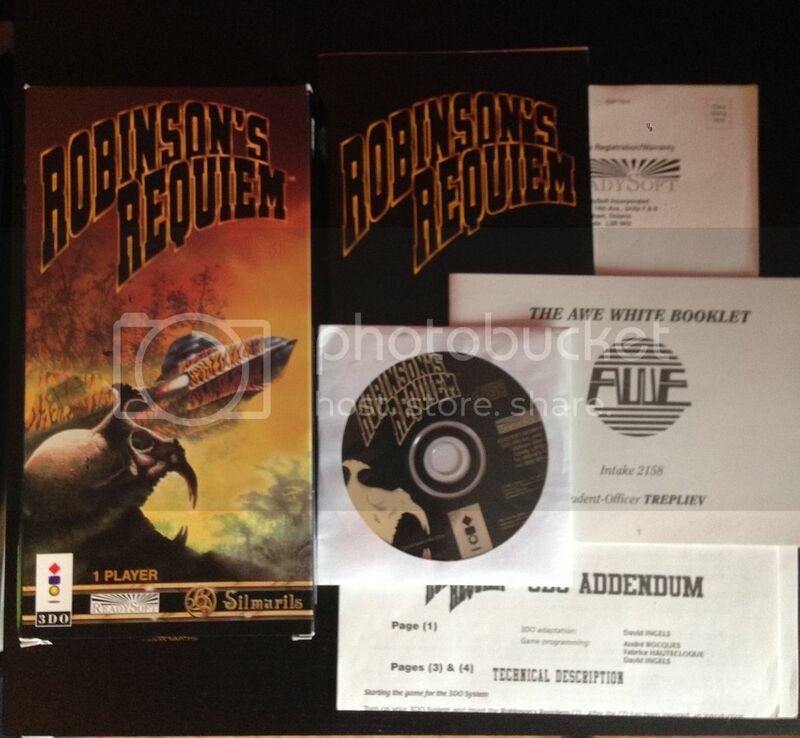 And yes, I am Opening the game as soon as it arrives and jumping on my 3DO as I always loved this game. Don't forget to submit it in the Documenting 3DO Game Contents thread! 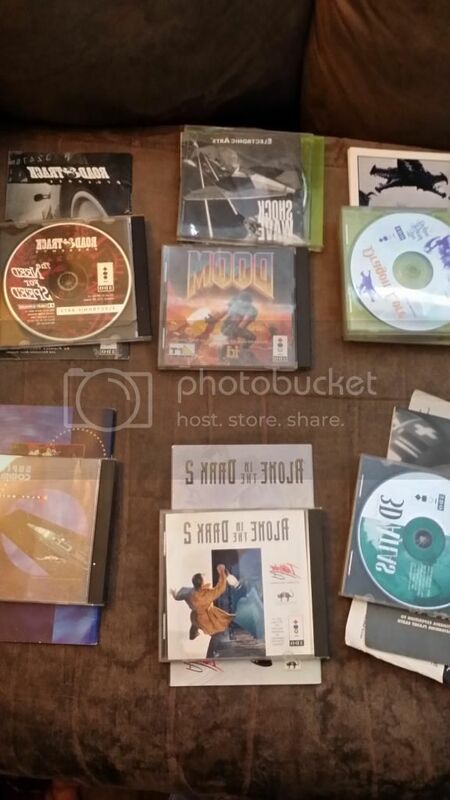 3DO Experience wrote: Don't forget to submit it in the Documenting 3DO Game Contents thread! Don't worry, I won't. I'll even take some pics as I open the Box so you all can see what it comes with. Sadly though, if I remember from a previous copy I got years ago that was brand new, all it comes with is the warranty card. Then again, I could be wrong. Now you got my wheels turning! D and Seal of the Pharoah arrived today. Since they didn't come with the long boxes, I can't add them to the documentation thread. However, they had the rear artwork and also their booklets, so all is good there. Sad though as I always thought that D's long box was creepy looking, so getting that would have rocked! Hmm, just snagged BC Racers and Cyberdillo. Not complete, but still playable, er hopefully. I also have to add Dragon Lore to the mix. The discs are loose, but I guess it's better than nothing. I'll probably slip those into a nice DVD carrier and make some groovy custom case art. I always loved the game anyway. Last I'll be adding to the list anyway because now I'm broke! Meh, still got my 3DO fix for the month anyway. Just picked up Killing Time. I played a few hrs yesterday, I can tell already that it's going to be one of my fav games for the system. I've got a few more games on their way too. 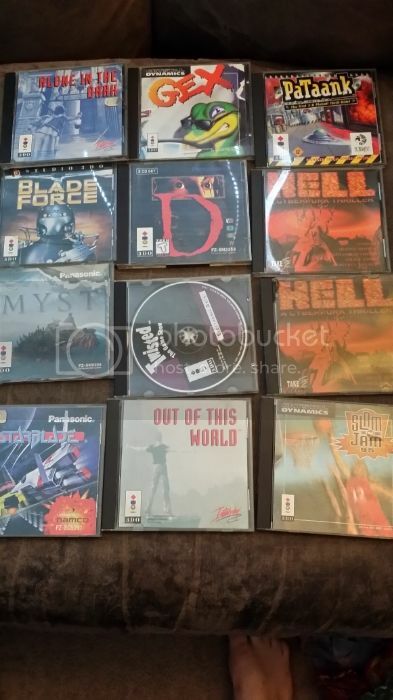 On a side note, I'm only about 30 games or so away from a full PAL/Euro 3DO set and I've got all the most difficult games to obtain, just got common titles to get now like John Madden, Starblade, etc. Thats nice. I hear the 3do version is rare and a brother to the Jaguar version. I've had a blow out month! Spent way too much. I have time and money to dedicate to my 3DO collection once more after neglecting it to pay off debts, and other life matters. I'm aiming to only collect VGC/as new items where possible. 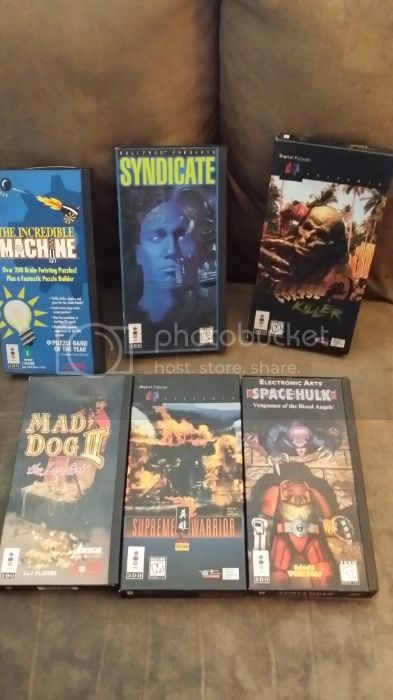 HELL, Quarantine, Shock Wave 1 & 2 + Expansion, Supreme Warrior, Corpse Killer. 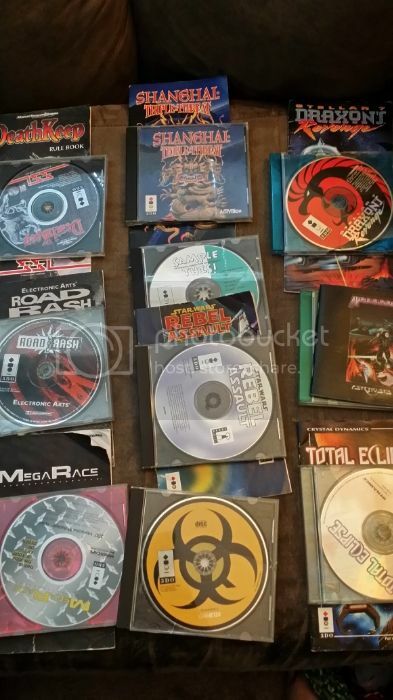 NFS, Road Rash, Space Hulk, Samurai Showdown, Off World Interceptor, Killing Time, WC 3, Pebble Beach Golf, Phoenix 3, Sewer Shark, Dragons Lair, Space Ace, Microcosm, Monster Manor, PO'ed, Burning Soldier, Star Wars Rebel Assault, Blade Force. I also purchased 2 Game Guns, Mad Dog 1 & 2, Crime Patrol, Drug Wars, Space Pirates, Who Shot Johnny Rock. I'm going to hold back this month! 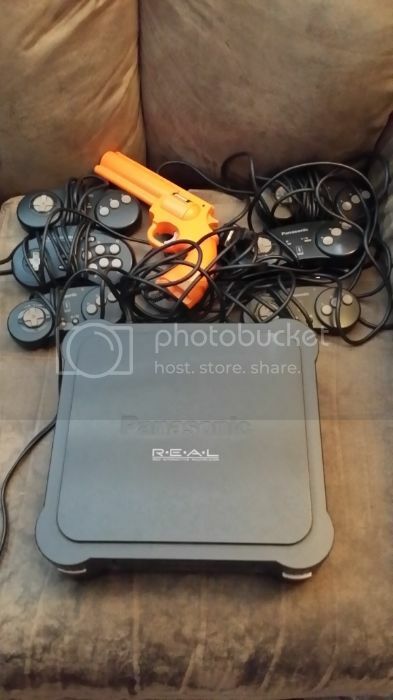 I'm looking into buying an NSTC J FZ-10 as the game guns don't seem to work on the PAL console (posted in technical about this) I'm hoping this will correct that issue. Today is a happy day. I finally got my hands on a copy of Iron Angel of the Apocalypse: The Return. And it's a sealed copy. Will be posting in the Documenting 3DO Game Contents thread soon. Great pick-ups, the lot of you!!! Finally got a pic of my month's purchases. I'm just waiting on Snow Job, Dragons Lair and my FZ-10 to arrive. I've decided to get a PVM 20L2 to run my gun games on - I just need to follow up the tech specs of that monitor to ensure the s-video is all good and what cables i might need to support that - I'll double it for the CMVS RGB stuff too! I'm aiming to find every game released on the system, hope i can achieve that. I've sold a lot of my other stuff off so i can focus on this one a bit more. But I'm not going to rush it. Played Captain Quasar last night as I never purchased it when i owned the system previous. Man, that game is super hard! Is it one continuous level? I got completely engulfed in chaos. Didn't last too long at all. Will try it again, and hopefully get somewhere. Woah, I actually missed RetroGamingBlog's post. That is indeed a nice set of pickups. Hell is just awesome, such a distinctively 3DO title with some real brain-teasing puzzles. Sorry to hear about your troubles with the Gameguns. I wish I could offer advice but as I live in the States this has never been an issue for me. The Gamegun is a great controller, though I have yet to find a good killer app for it (and perhaps none exists). Is one of those two Gameguns the two-player model? I have scoured the net for one but they appear to be a rare occurrence. Yes, I remember getting Hell way back in 95 and finding it insanely hard, that said we almost completed it looking at a play through recently. I'll probably stream a play through in the next few weeks. I might sell one gun off, although I'm not sure if it even works. There's absolutely no response on connection from the trigger or button. My favourite game is Space Hulk. Absolutely adore that game! Looking forward to Snow Job though. I'll post my next set of purchases soon. Woo got these beauties today. I was a bit burned by Alone in the dark 2 - no manual and cracked case! Sold as 'very good condition'. Absolutely gutted, but i only paid £4 for it, so I'm not too sore over it. The others are in as new condition, with exception to the horde. Really happy with these ones. Going to crack on and get ready to stream Gex and Horde tonight! They were the ones I REALLY played a lot of back in 95, so this has been a long time coming! I'm also extremely excited to play Star Control 2 - never played it, but heard such great things about it. Bring it on. Cool. Which version of The Horde did you get: the one which automatically wipes the 3DO's internal memory, or the later one? Star Control II is very old school 1980s PC gaming, but it can be very engaging if you take your time with it. (Sadly I didn't take my time with it on my first play.) A play through runs a good 30-40 hours and barring the use of a walkthrough you'll probably get the bad ending on your first try, so patience is required. It looks like you don't have a copy of the manual, too, which means it'll take even longer than usual to come to grips with how the game plays. Alone in the Dark 2 is an interesting choice, given that you haven't said anything about getting Alone in the Dark 1 yet. Any particular connection to it? Gex is so awesome. The Saturn and PlayStation ports of the game are actually better, but the 3DO version is still great fun. I owned and completed the first AitD on its release on the 3DO, I do remember having the second, but shelved it as I remember it being unplayable. I wanted to revisit it, and did so as it was at a reasonable price, despite being swindled on the description. That said. I will pick up a copy of the original when it becomes available to me in a condition I am happy with. I did okay through Star Control 2 this evening, and really enjoyed the game - I'm going to focus more on that one. The PAL version I have comes complete - at least to my knowledge. It reminded me of Star Flight on the Mega Drive and had me thinking if there was a connection? I suspect the version of The Horde I have is the one that causes the issues - I remember this, but can't remember how to identify it. I'm sure it was an additional code on the back of the box? It looks to be one line - whereas I'm sure the revised copies had 2 lines of text? Gex is great, even today. I have only ever played the 3DO iteration, and while there is slow down on the more frenetic levels - I have to admit its a game very much playable to today's standards. It's aged well. I didn't play Alone in the Dark 2 tonight, I'll keep that one back until I'm ready to face the awful frame rate issues! Cool, so you got the star map too? As for Star Flight, I've never heard of that game, and it's not listed on GameFAQs. Are you sure you aren't thinking of the original Star Control? That one got a port to the Mega Drive. I'm afraid I have no idea how to tell the difference between the two versions of The Horde. I'm surprised that no one else has spoken up about this, as I'm sure there's someone on these boards who knows. Gex has indeed aged very well, apart from its attempts at humor. Like many of Crystal Dynamics's games, it was a showcase for the 3DO technology, but not at the expense of the gameplay. It also helps that most of its innovations were never copied by other 2D platformers. And yeah, good luck with Alone in the Dark 2! EDIT: Just found this in the Wiki "Shazam!" - Starflight spawned a sequel, Starflight 2: Trade Routes of the Cloud Nebula. Ybarra went on to create Protostar, another space exploration adventure. Reiche was inspired by the game to create Star Control, with Johnson coding three of the alien species in the game; Computer Gaming World called Star Control II a spiritual successor to Starflight. Mass Effect director Casey Hudson tweeted in 2011 that "Starflight was a key inspiration for the ME series." Starflight is often mentioned along with its contemporary, Elite, which had come out two years earlier and featured similar gameplay, as breaking new ground for open world space exploration. Dwarf Fortress's forgotten beasts were inspired by the procedurally generated lifeforms within Starflight. I'm going to be streaming it again tonight, hopefully get the gist of it. Going to look up some info for guidance too. Very happy to report that 'The Horde' is A-Okay. It didn't wipe my Star Control 2 saves If i remember rightly it's to do with the serial code on the box, or the disc. I will post some stills of Snow Job - I managed to bag a MINT copy CIB. Double smileys all round. Have my recent purchases photographed. These are all in very good condition and complete afaik. Policenauts being one of my favorite games - very stoked it came pretty much as new. I've kept the spine card in the box, I've opened it as I like to play games in my collections - I usually open new games if purchased. I also have the patched english version - and a guide for the pure Japanese one to help guide through. Snow job has taken weeks to get here, but really pleased with the quality - came with a 3DO catalogue too, something I've not seen before as a UK owner. Tracy Scoggins was way hot back in the day.